We are welcoming some beautiful historic map paintings to our collection! Today we feature Door County, Wisconsin, but watch for France, Isreal, Nevada. And look for Osaka, Bannick and the Choteau area of Montana coming up soon! 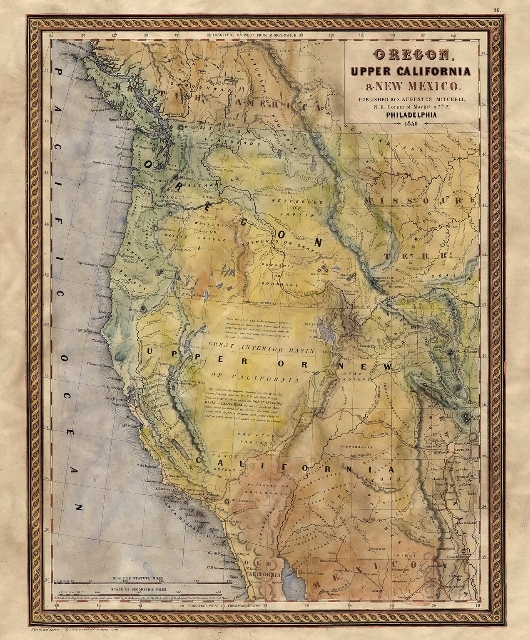 This map is an example of Mitchell’s 1849 map of the West, at the time of the discovery of gold in California and immediate after the completion of Fremont’s final expedition. Issued immediately prior to the edition which highlights the gold region. Bearing the date 1849, it is a rare pre-Gold Rush issue of the map. Please read more here. Original pages from this atlas are $1,200 each. Looking for ALL of Lisa Middleton’s historic maps in a broad range of originals, or varied print sizes and mediums?? Visit our SHOP page Lisa’s schedule of show appearances and links to our online shopping carts. Today we are featuring our NEW 1878 Door County Wisconsin Atlas Map–it notes the location of each lighthouse at that time, all townships, villages, and sections, and a street plan for Sturgeon Bay in the upper left inset. While the original map featured Jenny, Wisconsin (of Lincoln County), in the lower right, we have provided a list of names and construction dates for each of Door County’s Lighthouses. Door County was named after the passage between the tip of the Penninsula and Washington Island. The French called it, “Door of the Dead,” and the English/American sailors shortened that to “Death’s Door.” Locals will notice that today’s township of Sevastopol was intended to be Sebastopol, named after a Russian town. Our map is available as either an 11×17″ gift print for $24.95 or a beautiful ivory 16×20″ gift print for $50. Both are easy-frame versions for standard-sized frames. Call 888-255-7726 to order direct from Great River Arts, or click the SHOP link above and go to the FINE ART AMERICA link to purchase the print in every imaginable size and medium! Normal trade discounts apply to retailers. Our 1878 Door County Atlas map is also featured on line at MADE IN WISCONSIN.